DJ SOUND CULTURE ((David Chavez)) hails from Chicago. Sound Culture is one of the main instigators of World Music and Tropical Bass in the Midwest. Aside from producing some the hippest global concerts and street fests in Chicago for the Sound Culture Center for Global Arts, resident DJ at the CumbiaSazo monthly parties playing Tropical Bass, and remixer for Global Club Music Networks WOMEXimizer Re:mixes project. Among his many accolades are: Twice featured DJ at the World Music Festival Chicago – the longest running world music festival in the country, featured world music DJ at Folk and Roots Festival Chicago, featured DJ at Nomadic World Music Festival 2010, Voted favorite DJ by CHIRemezcla representing Chicago’s cutting edge Latin music scene for the national En Tu Cuidad campaign. AFROQBANO ((Harold Gonzalez Medina)) is a DJ, producer & eclectic music enthusiast. AfroQbano hails from Habana, Cuba, where he worked as a DJ for a number of underground House and Hip Hop clubs and also produced and toured with some of the most well-known Cuban artists and ensembles. After moving to Chicago, he established himself as an essential part of the Chicago global music scene. He is a frequent contributor to cultural programming across the city with regular residencies at some of the most popular Chicago clubs. His original tracks and remixes have been featured on albums and mix-tapes across the world. More recently he was recognized as one of Chicago’s top three DJ's in the Chicago Reader's "Best of 2016." While the Afro-Cuban and Latin rhythms of his culture are central to his sound, he embraces and merges a wide range of global & soulful music. His musical influences include diverse genres and styles such as House, Funk, Afrobeat, Hip Hop, Bhangra and Latin rhythms. Highlights of his career include sharing stages with luminaries like Mos Def, Pete Rock, Mulatu Astatke, Hypnotic Brass Ensemble, El Dusty, Rich Medina, La Mala Rodriguez, and Los Van Van. SLOMO ((Fausto Alejandro López)) was born in Xicago and channels his Cuban & Ecuadorian heritage through his love for music from across the afro-latin diaspora. Together he blends his Xicago roots with traditional sounds through a mixture of house, cumbia, reggae, tropical bass, and global remix. As part of Sound Culture Center for Global Arts and Future Rootz he entertains himself messing with digital designs, collecting music, staying up too late DJing, and producing events at various venues around the city including: Double Door, Boleo (Kimpton Gray), Emporium, Subterranean, The Whistler, Undergroud Wonderbar, Martyrs', Concord Music Hall, Simone's, and Harbee (Pilsen). Past shows/productions include: Quantic, La Dame Blanche, MAM Afterdark (Milwaukee Art Museum), El Dusty, Novalima, Bomba Estereo, Branko (Buraka som Sistema), Tribe Called Red, Denge Denge Denge, La Mala Rodriguez, Esso Afrojam Funkbeat, Quitapenas, Chancha Via Circuito, Victor Cruz (ZZK Records), Boogat, Lido Pimienta, Uproot Andy (Que Bajo), Geko Jones (Que Bajo), Atropolis (Cumba Mela), Thornato (Cumba Mela), Chief Boima (Dutty Artz), IBomBa, Cumbiasazo, K.Sabroso, Sound Culture Center for Global Arts, The Hot House, ((SONORAMA)), Lucha Libre DJ Set (Que Sabroso - Puerto Rico), Soulphonetics, FeExGlobal, Quennect 4, Apollo Project, Leftist Lounge, Cumbiasazo, Navy Pier, and Celebrate Clark Street World Music Festival. DJ ANGELFUK ((Sandra Treviño)) and FANITA BANANA ((Stephanie Manriquez)) are Chicago music enthusiasts and journalists. They play a large volume of female-fronted music with a focus on women empowerment, curating a digital source of articles and interviews featuring their favorite female artists that can be found at gozamos.com/theponderers. The Ponderers feature global tracks, with a focus on Latin America, spinning eclectic sounds created by the world’s fiercest chicas poderosas in both digital and vinyl formats. During their show you can also expect guest DJs, interviews and the freshest cuts in Latin alternative music. They play across the CITY including festivals and events at venues like Double Door, Thalia Hall, punch house, Subterranean, Martyrs', Concord Music Hall, Lagunitas, marz, The Portage Theater, and Harbee (Pilsen). 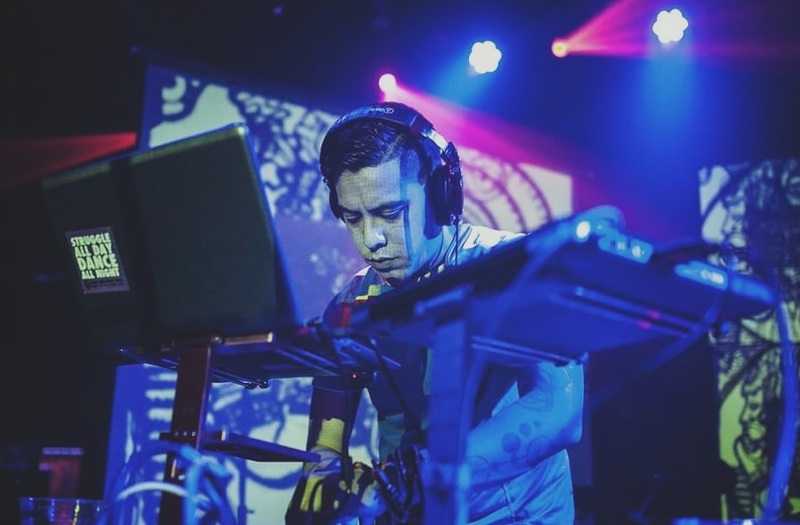 MOS ((Hector Herrera Yepez)) is founder and producer of Villapalooza, a free, all-day, all-ages music festival dedicated to promoting non-violent spaces for arts, culture, and community engagement in Chicago. GIROSCOPIO ((Charly Garcia)), is one third of the trio (((Sonorama))), a Chicago-based vinyl collective that is known for energizing dance floors and sound waves with a unique blend of vintage Latin sounds. Founded in 2010 by Charly and brothers Edgar and Marlowe Baca, Sonorama is a group of insatiable diggers and lovers of mus­ic on vinyl. In early 2015 the trio launched the debut of (((Sonorama))) Discos (el disco es cultura), marking their interest in seeking and releasing contemporary bands and music with similar leanings to Latin America's sonic past and an ear for fresh approaches to that tradition.